BABYBJÖRN Travel Crib Light is what makes traveling with babies easier and much more enjoyable. Bring it in the special travel bag wherever you decide to go, then unfold it effortlessly and locate at the best spot. Its weight is low and its size is small, so you can even bring it on the plane or put it into your luggage. Your little one can nap in it during the day, while you are enjoying your lunch or working in front of your laptop, and sleep in it at night. This travel crib is appropriate to use until your baby turns 3. A really lightweight and easy-to-use crib that is ideal to travel with. A mattress in a crib is a very important part. The Travel Crib Light has a comfortable and soft mattress, which creates a perfect space for your baby`s day nap or a proper night sleep. There is also a built-in base plate in the mattress, that ensures that this crib is firm on the floor, and your baby is safe. Setting this crib up and folding it is quick and easy. You can do it in just one movement. There is no need to attach any loose parts, and the legs unfold automatically. By putting the special mattress in, you create a proper travel crib that you can use anywhere – at home or while traveling. Packing for a trip with a baby can be complicated, which is why buying a light travel crib, like this one is a source of relief for most parents. The crib weights just 13lbs, and the set includes a special travel bag that fits it in. The weight is 11 pounds. The dimensions are 44 x 25 x 32 inches. All materials are approved according to the standard Oeko-Tex Standard 100, Class 1 for baby products. The fabric used to cover the crib is 100% polyester. You can remove the fabric and wash it in the washing machine. 82% of all customers have given this product a 5-star review. They point out how light and convenient the crib was. Some of them have been using it for years and continue to do so. Others buy it as a gift now to friends who have just become parents. Some of the customers, among whom just 1% has given the product a 1-star review, complain about the size of the crib. However, the dimensions are noted everywhere, so you know in advance the size of it. If you need a bigger crib/playard, make sure to check the numbers and look for the more suitable option. For parents who need a small and light crib, perfect for moving around and travelling, this is the perfect option. In general, most customers are more than happy. They mention that a trip with a baby is much less of a challenge, when you have BABYBJÖRN Travel Crib Light with you. They believe that the price they paid was worth it, and they recommend this product to others as well. BABYBJÖRN Travel Crib Light is an ultimate option for busy parents or for those who travel a lot. If you need a safe space for your baby to be in, while you are working or packing your bags, this is what you are looking for. The weight and its mechanism make it an easily transportable tool, that you could use no matter where you go. A weekend at the grandparents? A 3-day trip to a friend`s beach house? A 2-week vacation? This crib is what you need for all of those occasions. Q: Is there a bassinet for a newborn included? A: No, there is no bassinet in this set. Q: Can we let our baby sleep in it for a couple of weeks on a trip? A: Yes, you can, this is exactly what BABYBJÖRN Travel Crib Light was created for. Q: Is it possible to fit the travel bag with the crib into an overhead compartment on the airplane? A: No, it is not, but you can check it in as a separate luggage piece, put it in your suitcase or take with you on board and ask to leave it where the strollers are usually kept on the plane. 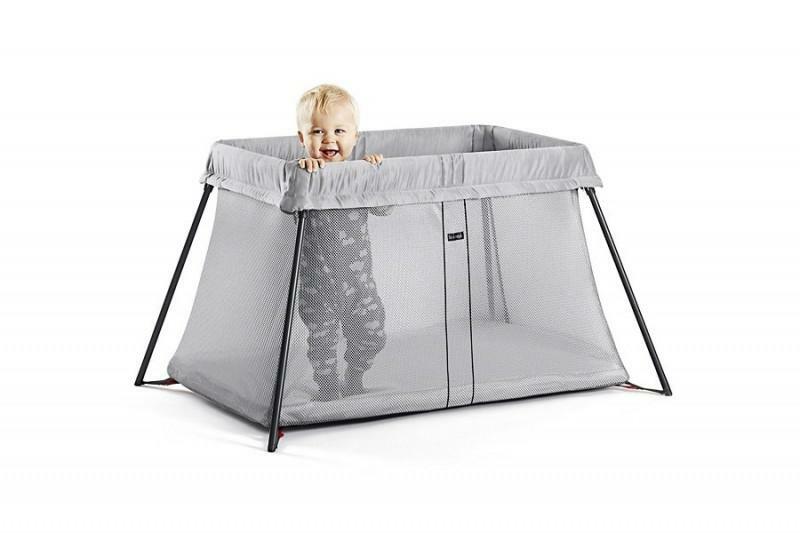 Q: Is there a need to buy a waterproof sheet for this crib? A: No, because the mattress is waterproof already. Q: Can we use the dryer after the washing for the mattress? A: Yes, it is perfectly fine to do that.